To study in Florence, Italy is to learn Italian in the city of the arts. 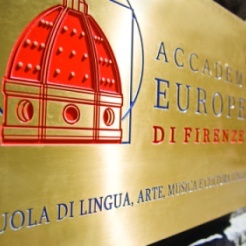 Accademia Europea di Firenze is an Italian language school that participates actively in the city's varied cultural activities, creating an atmosphere of spontaneous and pleasant interaction between Italian and foreign residents. Perfect for people who want to learn Italian. Our school offers Italian language, arts, music and culture courses. Those intending to follow an art program in Florence (for professional, teaching or personal reasons) can choose the intensive art course and study the techniques and language in depth. This course is recommended to students who are in training for applications to conservatories and music schools or art schools. In addition to the Italian course, students can choose to attend one more course (2 classes/week), two courses (4 classes/week) or 3 courses (6 classes/week). Although the students themselves can choose the courses they wish to attend, an instructor will evaluate their level and advise them upon their choices. The italian courses is structured in 4-week sessions; on the first day of the course, students take an entrance test to check their level and are placed in classes of up to 12 people. On the last day of the course, a final exam is held to allow access to the next level. Alongside the course, the student is free to benefit from the any of the afternoon activities put on by the school. These comprise of visits to museums and places of interest, film showings, walks through the city, rafting on the Arno and much more. The activities are considered to be an integral part of the educational program, and a teacher is always present. They are free of charge, aside from entrance tickets and possible transport costs. For further information, please consult the calendar.